This small expansion adds the 12 tiles that represent the actual city of Carcassonne and are the starting tiles for the game. During the game, players who help others score points may place followers in the city and later move them to scoring features outside the city. Yet another new way to play this great game! The Count is not a complete game, but must be played with Carcassonne. This small expansion doesn’t really add too much to the game, but also doesn’t cost much either. I’ll be honest, we never play the included rules with The Count expansion. It does reward helping other players but the extra rules tend to make the game more confusing for new players and distract from the overall playability of Carcassonne. If we get out The Count, we use the starting city instead of the starting tile or The River to have a greater number of places to start building. The Grimace looking meeple that represents the Count becomes a mascot/heckler for us during the game. One of the nice benefits of adding The Count to your collection is that it gives you more abilities to make up rules, which we do often with our toddlers when playing Carcassonne. My boys often use The Count meeple to protect the Princess from the Dragon earning them an additional tile draw. So, while it doesn’t really add too much, it’s worth the few bucks to give more starting/rule options to keep Carcassonne play fresh and interesting and spawning creativity. Plus, it stores easily it’s packing and fits nicely in the Carcassonne box. This is a small expansion for Carcasonne. You get a count meeple, twelve tiles for the city, and a small folded up set of rules. It all comes in a little box that easily fits into the regular Carcasonne box. The twelve tiles form a city, which are the new starting tiles. Each player builds off of this on their turn. If you use the river, the spring attaches pointing away from the castle where ever you wish. The game is played as normal, but if your placement of a tile causes another player to score and you do not score, you may place a meeple in one of four places of the castle. Each place in the castle corresponds to the castles, cloisters, roads, and fields. You also are allowed to move the count to one of these places. Later when something else is scored you may move your meeples from the count’s castle to the scoring feature. These count towards ownership. In this way you could gets points on something you had no meeples, or you could get one more meeple in and take control. This makes the game much more nasty than an ordinary game of Carcassonne. It is a small, cheap, and easy to learn expansion. I recommend it for anyone that wants greater competition in Caracassonne. Okay, no, Catapult is still worse. The count adds a lot of kill-stealing to Carcassonne. If you enjoy that sort of thing, it might be right for you. Although this small expansion is inexpensive, I do not beleive this is worth wasting ones time on. There is very little value added to the overall game of Carcassonne. I was not impressed with the replay value. This is a must have for anyone who wants to collect every expansion and it does come with some interesting componants. Do not expect to make the game more enjoyable or payable with this expansion. 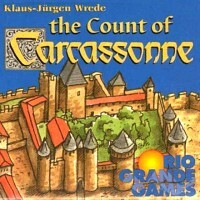 Add a Review for "Carcassonne: The Count"